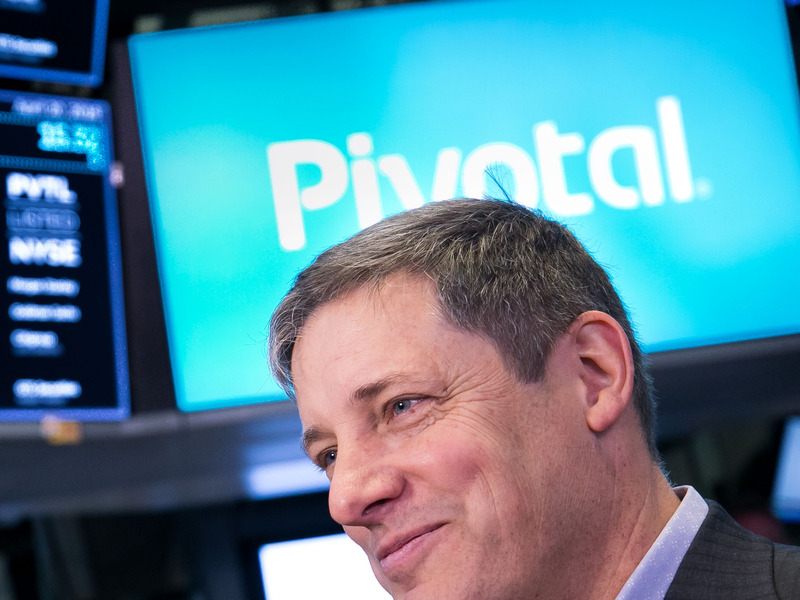 Pivotal Software beat the street with its first-ever earnings report as a public company. In an interview, CEO Rob Mee says that its customers aren't going all-in on Amazon's, Microsoft's, or Google's cloud computing platforms, but rather a mixture of the three, plus their own servers. That's good news for Pivotal, which provides tools for making it easier to run software across multiple clouds and data centers. Pivotal Software just reported its first-ever earnings report as a public company, following its IPO in late April. And it beat Wall Street expectations on the top and bottom lines, sending the stock soaring more than 7% in after-hours trading. Specifically, Pivotal reported a loss per share of $0.31 on a GAAP basis on revenues of $155.7 million for the first quarter of its 2019 fiscal year, versus an expected loss of $0.39 per share on $140.4 million of revenues. Driving the growth, Pivotal CEO Rob Mee tells Business Insider, is the continuation of the company's long-time strategy, as revenue from software subscriptions grew 20% from the same period last year. "I don't think there are that many technologies or approaches out there that accelerate your productivity and save you a ton of money, and I feel like we do that," says Mee. Pivotal operates two main business units: Pivotal Labs, a software consulting unit that trains engineers at big companies in how to move as fast as startups, and Pivotal Cloud Foundry (PCF), a platform for building software that can run on any server, or any cloud computing service. It's the latter that's really punching above its weight, says Mee. For the "foreseeable future," most companies aren't placing all of their bets on Amazon Web Services, Microsoft Azure, or Google Cloud — but rather a mixture of the three. The sales pitch for PCF is that you install it on your servers, your cloud deployments, or both, and software will run seamlessly across the whole spectrum without any major changes. That's where the cost savings comes in, as well as the productivity, as customers can make more efficient use of their platforms while also cutting down on complexity. "Our multi-cloud strategy is still serving us well," says Mee. So don't expect that strategy to change. In fact, Mee says, he hasn't noticed many changes at Pivotal in the months since IPO. That's at least partially because Pivotal adopted a public company-like accounting regimen when it spun off from tech titan EMC in 2013, and has stuck with it under the auspices of CFO Cynthia Gaylor. "We've been operating as a public company for some time," says Mee. "I haven't noticed much change."